Remembering Ghantasala (Dec 4th 1922 – Feb 11th 1974) with utmost respect on his 38th anniversary (Feb 11th, 2012) …. Ghantasala Venkateswara Rao, legendary singer in Telugu film industry reigned as a leading/only playback male singer for up to 3 decades and sang about 10000 songs in Telugu, Tamil, Kannada, Malayalam, Tulu and Hindi languages. He was the recipient of the civilian honor, Padmashree. He was a classically trained singer and his divine, melodious, expressive, golden voice was loved by one and all. 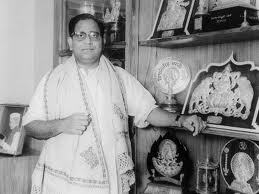 Ghantasala has sung many classics in hundreds of social, historical, folk and mythological movies. Some other famous non-film renditions of Ghatansala include Karunasri Jandhyala Papaiah Sastry’s Pushpa Vilapam and Kunthi Kumari, many devotional and patriotic albums and the very popular Bhagavad Gita which he recorded literally on his death bed. Ghantasala was not only a magnificent singer but also a wonderful poet and an accomplished music director. The music he scored for super hit movies like Paataala Bhairavi, Gundamma Katha, Pelli Chesi Choodu, Maya Bazaar and Lava Kusa is still so fresh in the hearts of Telugu film lovers. He is well known for classical improvisations in the art of light music. This particular song from the movie “Pandava Vanavasam”, is composed and sung by him along with melodious P.Susheela. While in exile, the Pandavas happen to stay on Himalaya mountains (Hima giri). There Draupadi sings, when romantic mood sprouts within her, as she looks around and is mesmerized by the beauty of the mountains and forests. This song is picturized on NTR and Savitri as Bheema and Draupadi. Shreedhar Ganapathy has joined me in paying tribute to Ghantasala. Shreedhar is a fantastic, versatile singer with a powerful voice who performs live as wonderfully as in his recordings. Shreedhar has done an outstanding job in this song, singing the difficult aalaaps with so much command. I am so thrilled to have chosen the right singer for this song and extremely thankful to him for accepting my request to sing this and then for finishing this on time in the middle of his busy schedule. Also, special thanks to Shreedhar for patiently mixing this !!! Excellent job both of you! Very well sung. Your song selection is quite good. Keep up the good work.